In my last six month of my bachelor studies I set up my own project in the metalworking shop on the University to learn how to machine metal. Machining metal is an essential skill for a prototyper, as it opens up a whole world of mechanical possibilities. Over the course of the six months I learned how to use the hand file (you got to start somewhere!) the drill press, the lathe and the mill. As an end assignment I created a C-clamp from raw stock, as it covers all the topics. 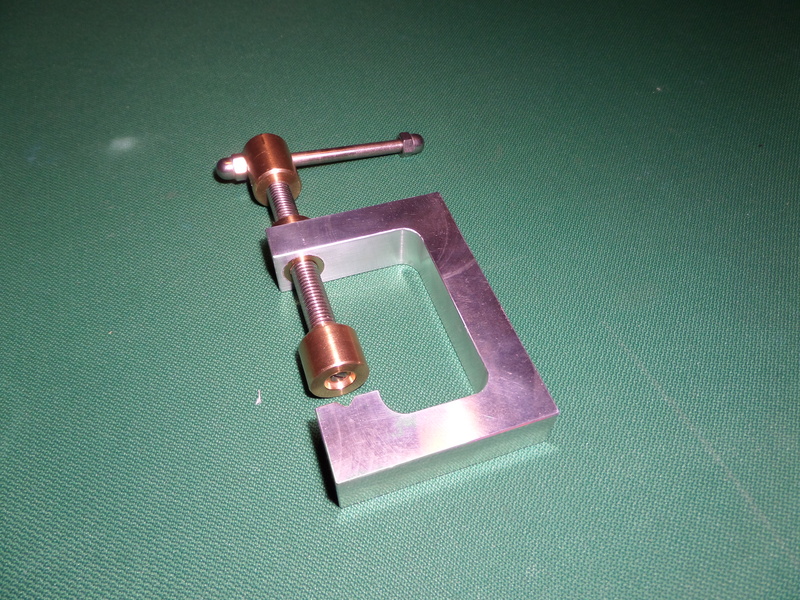 The clamp body is constructed from aluminium. This part is made on the mill. The inside curve is one smooth surface, and was the most complex cutting operation of this project. If I would stop or overshoot the smooth inner surface would be ruined. This tool path was redone several times until the part was up to dimension. The supporting parts are made of brass and are created on the lathe. Brass is a very nice material to work with and offers an attractive contrast with the aluminium. 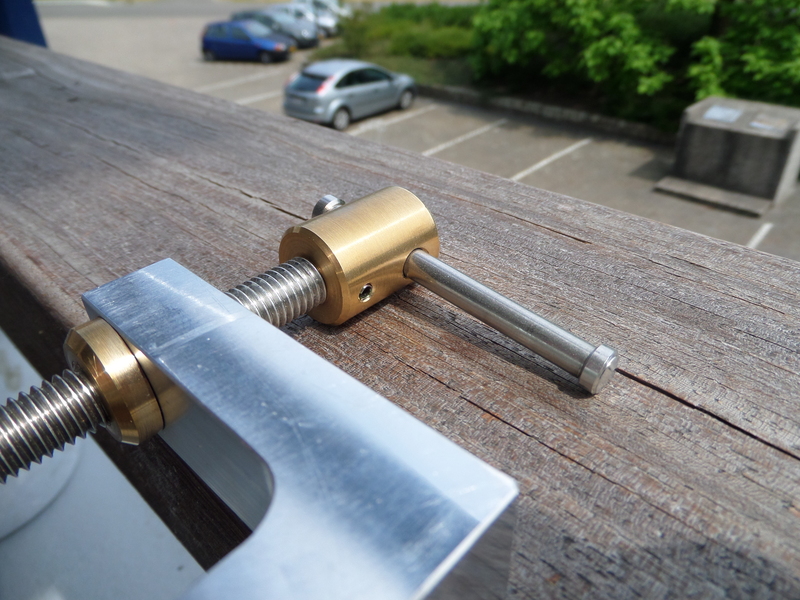 The clamping head can rotate freely, so it will not damage the surface of the clamped object. The screw is made from steel, and so is the handle. After this metalworking project I am confident in creating my own parts, expanding the possibilities of my own prototypes. The course Cyber Crime Science had a final project where we had to identify a local crime and find a technical solution for it. We chose to tackle the crime of littering in the student association room. To encourage throwing away trash we devised a system where the occupants of the room were given a choice between two trash cans, a red one and a blue one. A screen nearby informed the occupants of the current topic being voted on. This topic was always chosen to be popular and controversial, such as ‘PC vs Mac’ ‘Cola vs Pepsi’. The trashcans were equipped with a distance sensor in the opening, thus detecting pieces of trash. Results were shown on the screen. We hypothesized that by giving people the means to express their opinion the trashcans were more actively used. The experiment design involved asking groups of two people to solve a puzzle while handed a drink and a plastic wrapped snack. After they solved the puzzle we asked them to wait until they finished their drinks and snacks. Then they were notified of the trash can system by a sound byte. Their disposing behavior was recorded and afterwards a questionnaire was given. We observed different littering behavior and more trash can usage in the intervention group that were exposed to the trash can system, in contrast to the control group that was not. More detailed information available in the presentation slides. 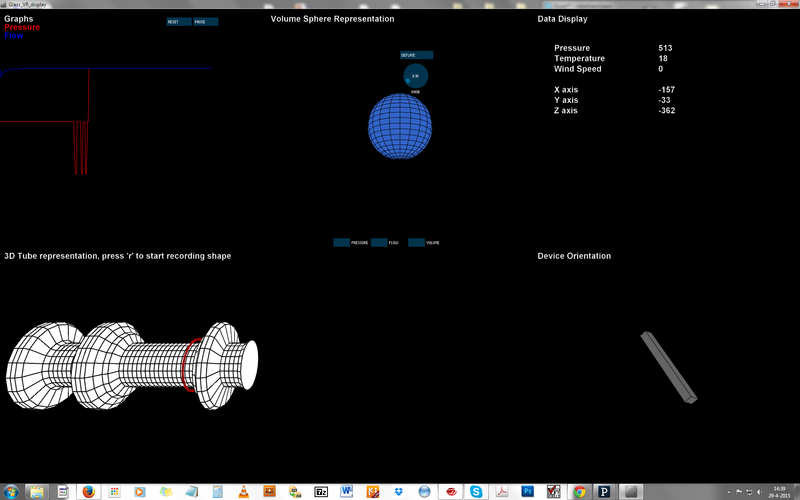 Puff and Sip virtual Glassblowing hardware controller. By Robert Wendrich from Raw Shaping Technology I was commissioned to create a tangible user interface for a glassblowing like interactivity with the computer. This hybrid interface has great potential as an interface for an computer as human mouth output has a very high fidelity, and everyone is able to modulate it very precisely. 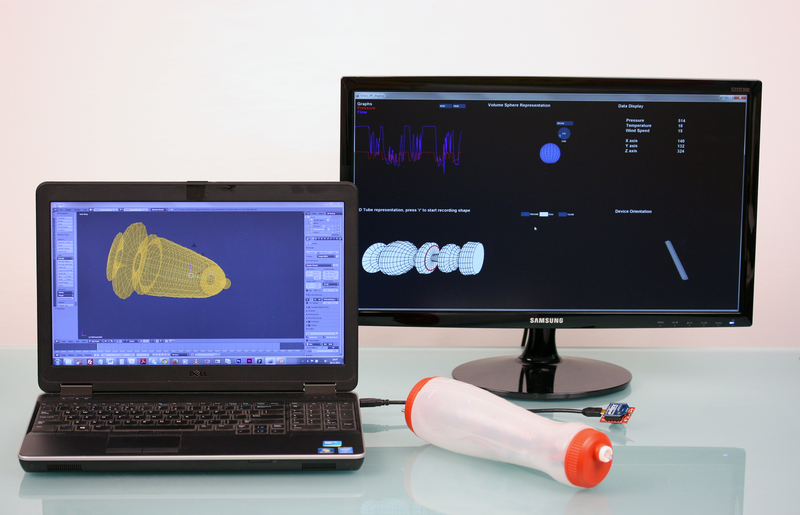 Device overview, showing generated shape in Blender, visualizer and the device itself. The device is based on an Arduino. 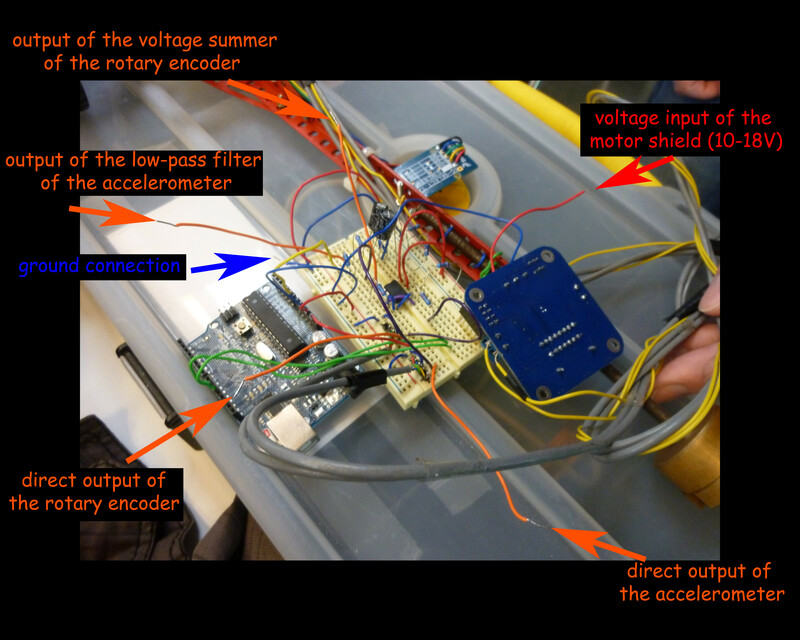 The Arduino gathers data from several sensors and sends those wireless to the PC. The sensors chosen to give the user a glassblowing like experience are a pressure sensor and an air flow sensor. Both of these sensors are ranged for human mouth output and give fantastic output. The device is also equipped with a orientation sensor to send the orientation angle values of the device to the PC, this data can be used to simulate a virtual glass blowpipe. 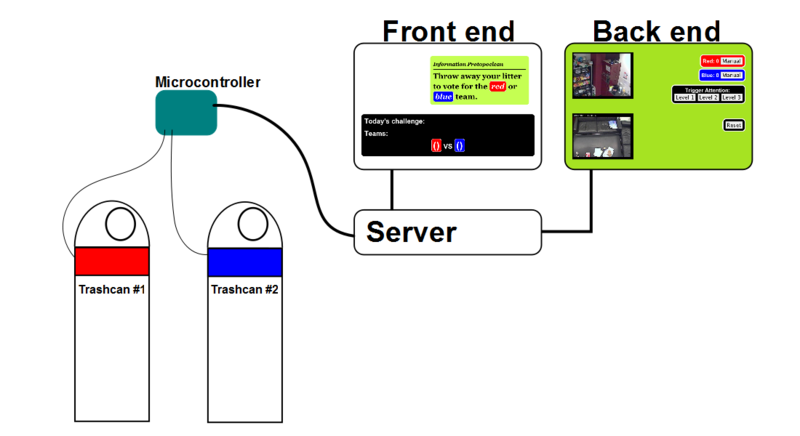 The scope of this project involved a hardware prototype, and a software visualization. This visualization is just to show the data, it is not a full simulation of molten glass, as that would be beyond the scope of the project. The software is divided into five different sections displaying the data in different ways. The visualization is written in the Processing language, a language made for graphical programming. The first display shows the data from the pressure and flow sensors in a graph, the second display shows a sphere showing a cumulative value based on the sensor values, this gives a sense of volume. The third display are just the latest numbers received, handy for debugging. 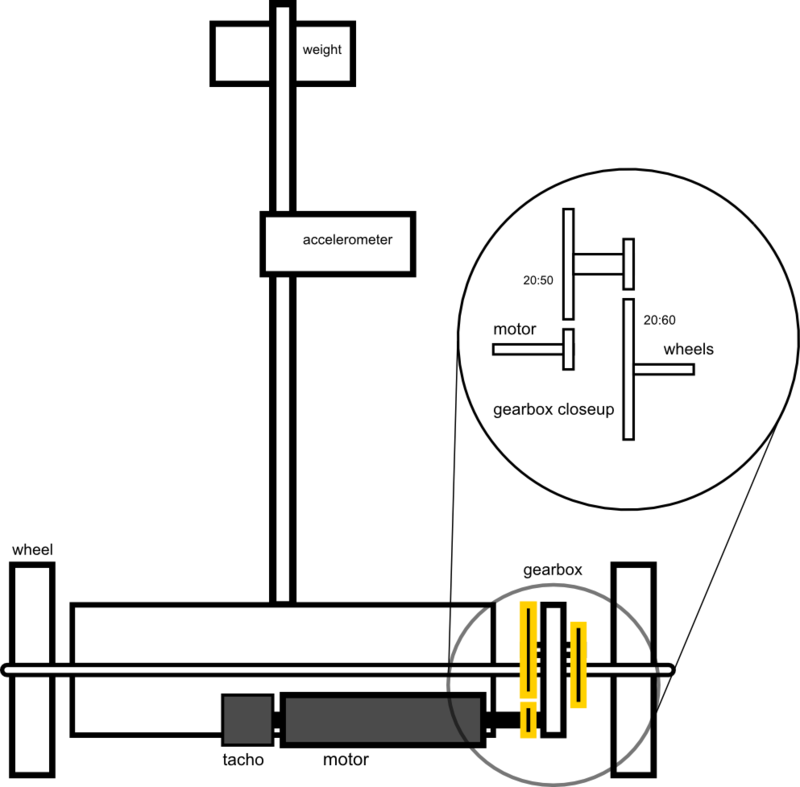 The large display below shows a tube that is continually drawn using the latest data, its diameter is set by the pressure, flow or cumulative values. This visualization serves as a raw design tool, and shows using the data from the device is interesting and accurate enough to create shapes. These shapes can be recorded and exported as a mesh data file. This file can be opened in the 3D suite Blender with a script to further iterate the design. The final visualization is a bar representing the orientation of the device. Below is a video presentation of the device, also going in detail over the internals. An open assignment for an interesting course I followed had the goal of creating a new novel design tool with audio feedback. For this I created a capacitive sensor. This sensor consists of a wire sticking straight up. The principle of a capacitive sensor works by being one half of a capacitor. Your hand or anything else that can store capacitance is the other half of the capacitor. The capacitiveSensor method toggles a microcontroller send pin to a new state and then waits for the receive pin to change to the same state as the send pin. A variable is incremented inside a while loop to time the receive pin’s state change. The method then reports the variable’s value, which is in arbitrary units. This measured value is sent to the computer where software written in processing uses this value for display purposes. As a visualization a constantly updating stack of circles is used. This gives the impression of a tube. A new circle is drawn with the measured value of the sensor. Also an tone is played based on this value. This makes it a rudimentary theremin. The audio feedback gives extra depth to moving your hand around the sensor and gives the user directly a better understanding of how his actions change the visualization. From an old HP ink jet printer I salvaged a linear actuator assembly. 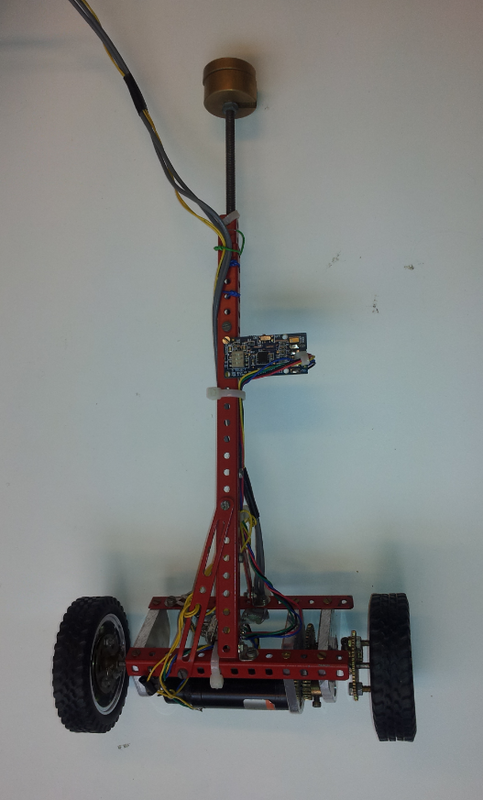 This assembly consists of a DC motor, sliding rods, a carriage, toothed belt connected to the carriage and an optical linear encoder with the corresponding sensor on the carriage. The sensor on the carriage is connected to the interrupts of the arduino, so no pulse is missed. By keeping track of the pulses the carriage knows where it is. 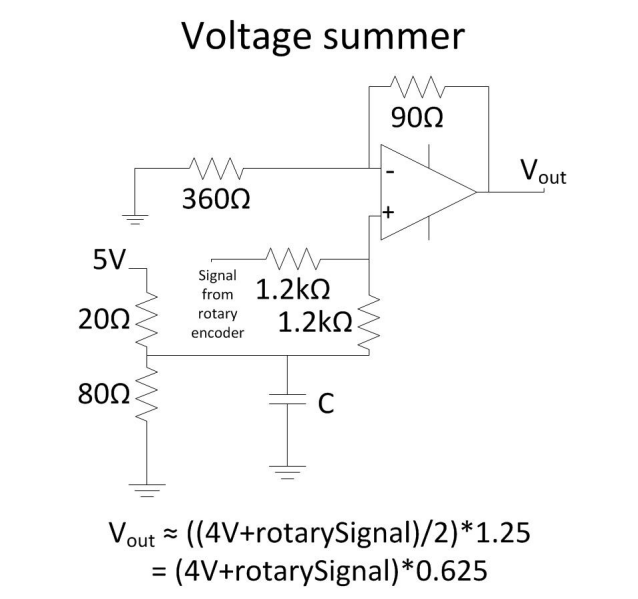 A H bridge motor controller is used to actuate the DC motor, this moves the carriage. 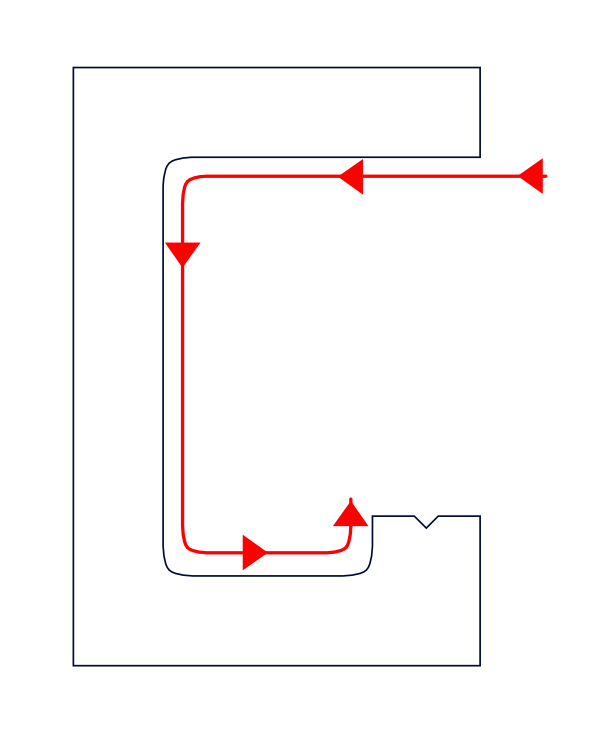 A simple control loop was made to have the carriage more back to a set point on the actuator. In this video I show the details of how my pattern programmer for the NeoPixels work. This little project is a continuation of the leds I used on the chaotic pendulum. With the software you can draw patterns by hand or load up an image. The software programs the values to the arduino’s EEPROM, this means the device can be disconnected and powered down, while still preserving the pattern. After programming no PC is required anymore. I used this little installation with great success as a quick way to add interesting RGB light effect to clothing on Makerfaires. Chaotic Pendulum with programmable RGB LEDs. For my bachelor project I have created a technical art installation. The exact course of the project was not a smooth one and I won’t go into the details how we arrived at this prototype, but I will describe what we ended up with. The device is a double pendulum constructed out of laser cut plywood. 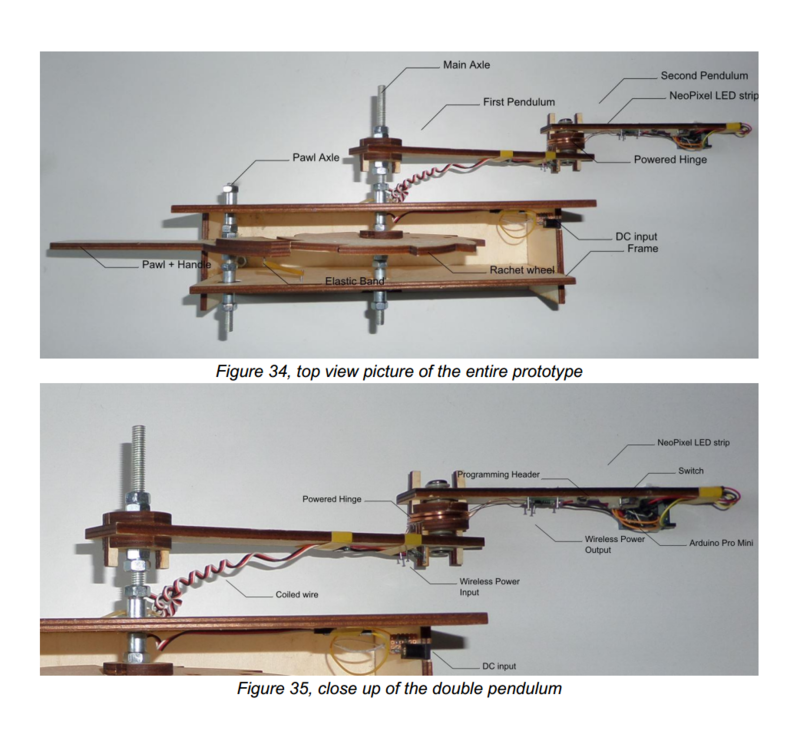 A double pendulum exhibits chaotic behavior. The device features bearings for smooth rotation and a wireless power transfer system. The wireless power transfer system at the joint makes batteries not required at the end of the pendulum. Batteries would make the pendulum very heavy and swing around much less. The following album shows the design of the power system in the free rotating join. The following pictures show the complete construction of the prototype and its components. The pendulum can be cranked up with a ratchet wheel system. When ready the pendulum is released and swings in a chaotic fashion. The lights on the device are programmable in software on a PC. With this setup great long exposure pictures can be taken. The chaotic nature of the motion in combination with the fixed patterns creates very interesting images, the following album shows several different patterns being displayed by the device. Details of how the RGB leds are programmed are in a seperate post. When I click or drag anywhere in the spectrum it sends the RGB values to the arduino. When the LED-strip arrived I bought some transistors (BUZ11’s, extreme overkill, but hey.. ) and hooked everything up.